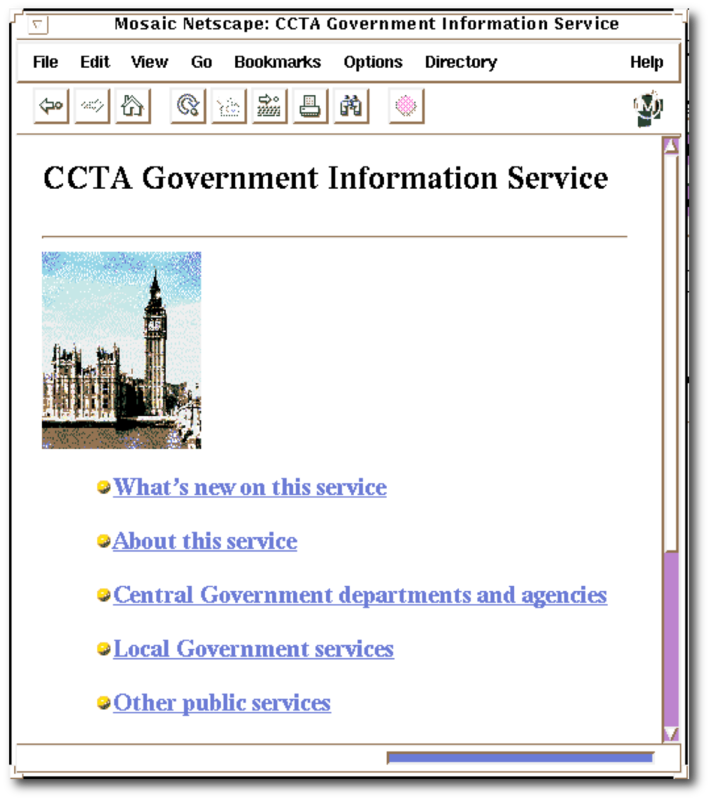 It’s 20 years ago this month that the UK government first launched a website intended to provide a simplified, single point of access to information from across the public sector. I thought I’d add a little more detail — or at least, a few historic screenshots — to support my recent CIO column marking the anniversary. 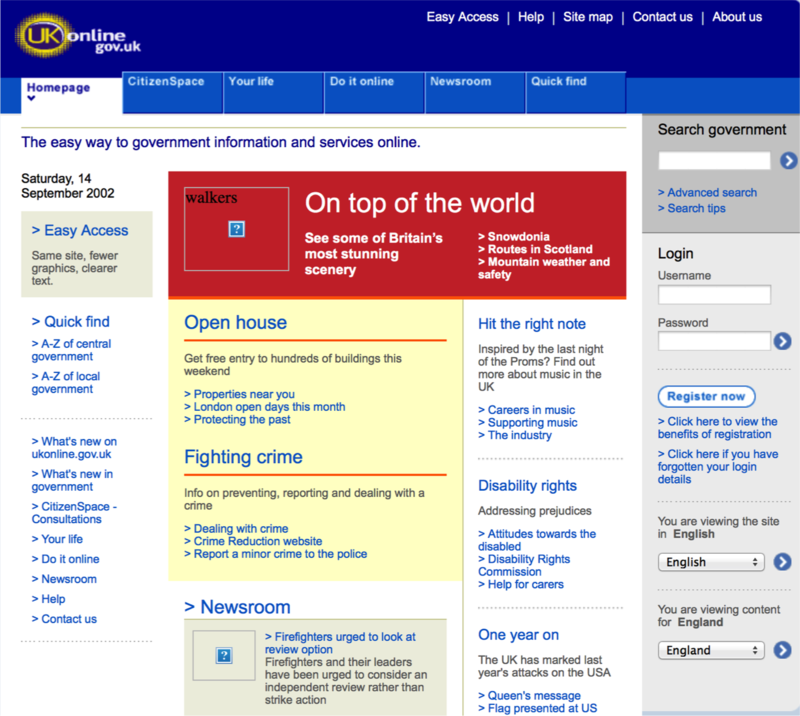 The Government Information Service (GIS), hosted at open.gov.uk, launched in November 1994. 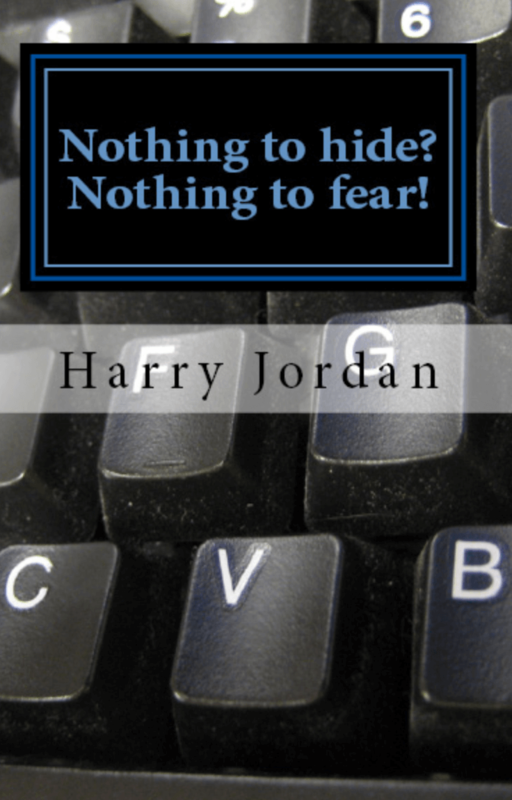 It was intended that over 400 public sector organisations, including government departments, local authorities and police forces, would provide their information on the site, which received around 200,000 hits a day shortly after launch. By mid 1997 it was approaching 2m requests a week. 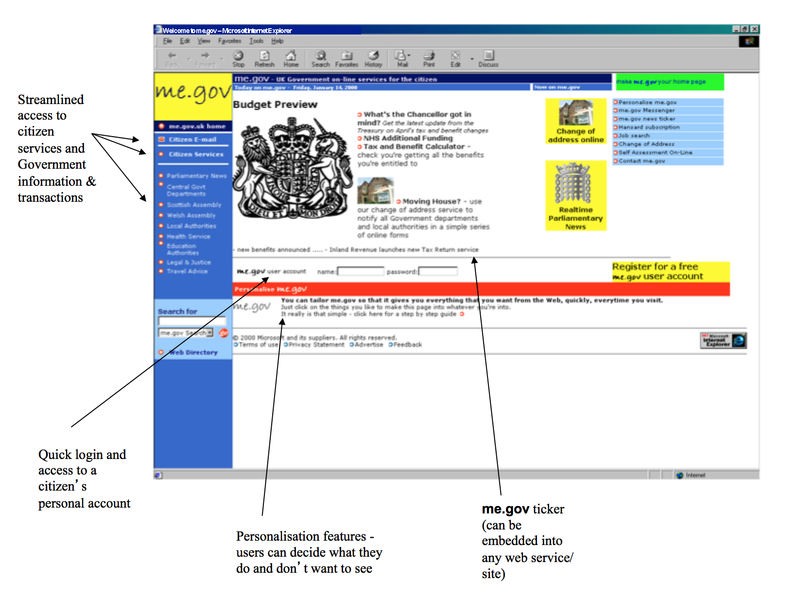 In 1999, the “Portal Feasibility Study” (PDF) set out plans for a more comprehensive approach to delivering all government services online in one place. 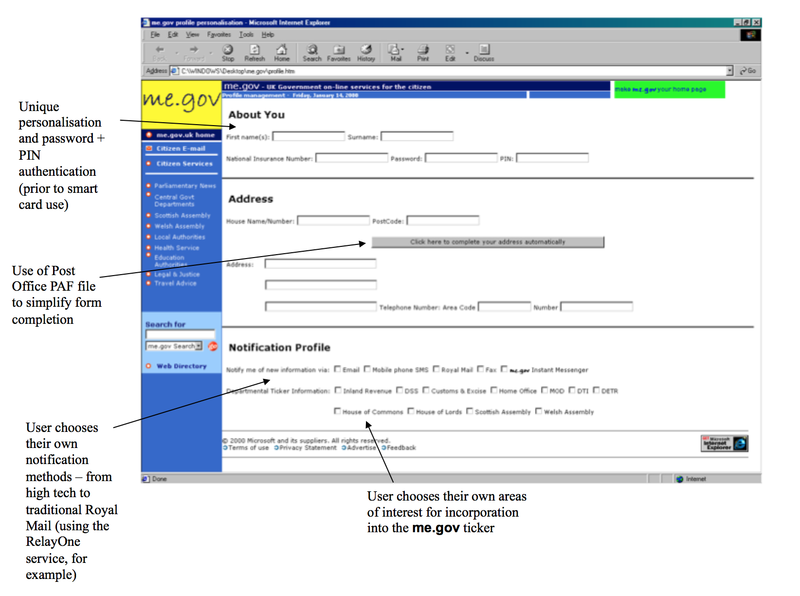 The portal element of this architecture was originally nicknamed “me.gov”: below are some mockups from 2000 of how it was envisaged it might look during early envisaging. 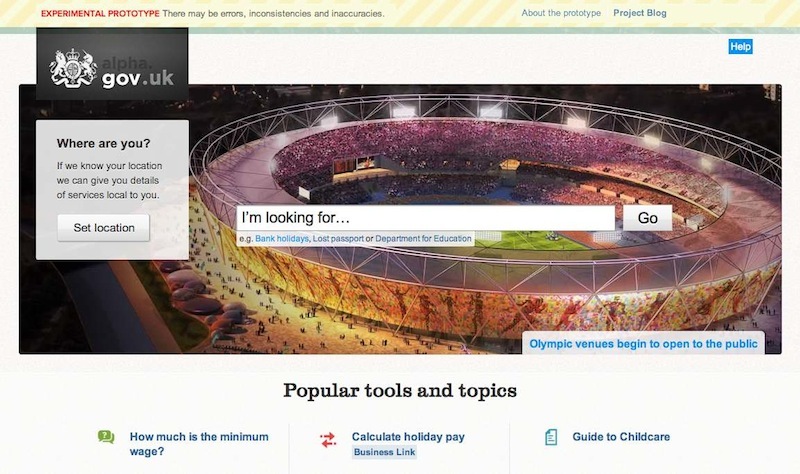 By the time of its launch, it had become “UKonline”. 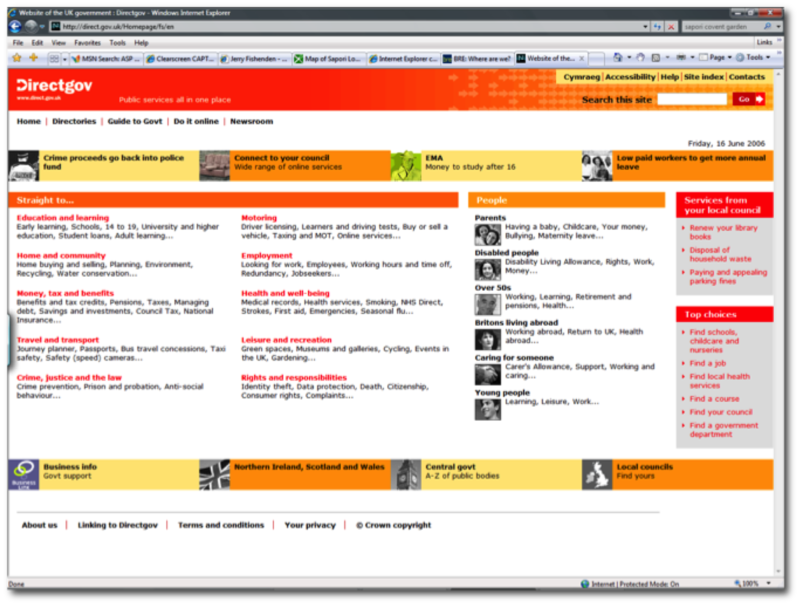 UKonline initially appeared as a beta site in November 2000, followed by a formal launch in February 2001. 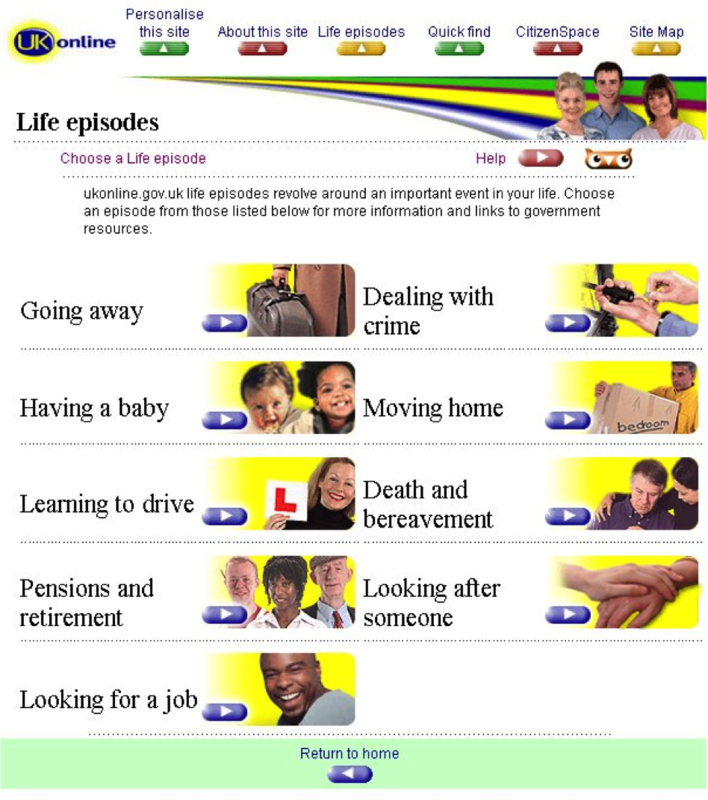 UKonline aimed to provide more integrated services, built around citizens’ “life episodes” (events that had meaning to them), rather than just projecting the departmentally-based silo services already in existence. The 1st March 2004 saw another rebrand and relaunch, this time as Directgov. 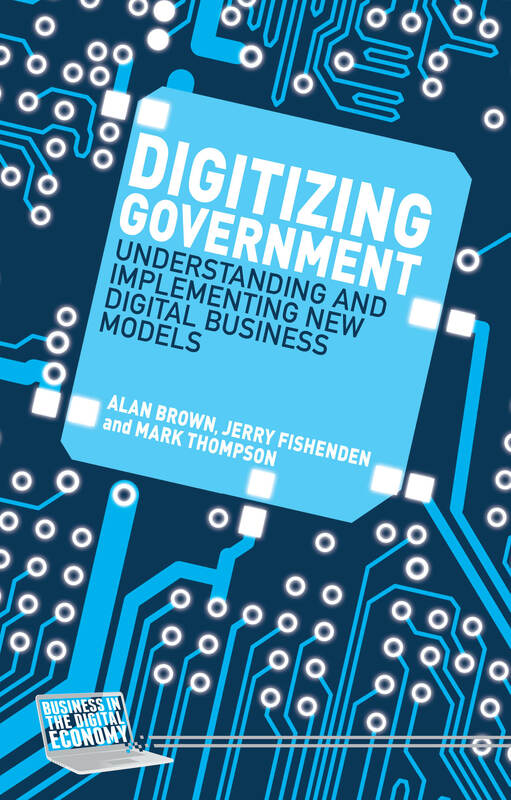 In May 2011, Directgov (and its sister site, BusinessLink — dedicated to meeting the needs of UK business users) began to be superseded by GOV.UK, initially as an alpha. 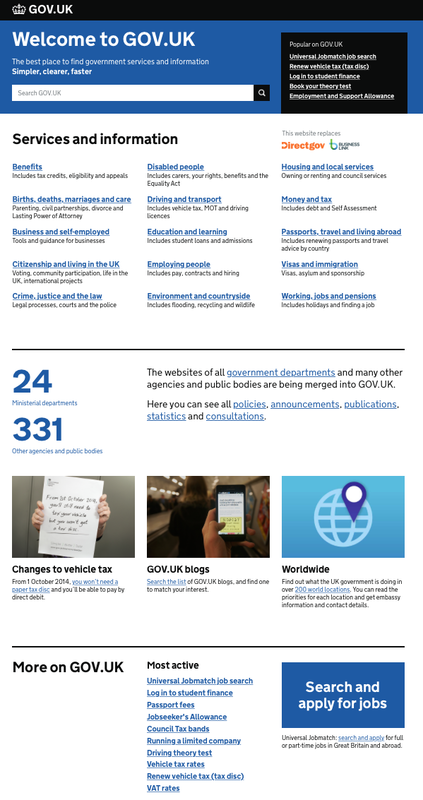 In October 2012, the site replaced Directgov and went fully operational as GOV.UK, celebrating its second birthday just last month. 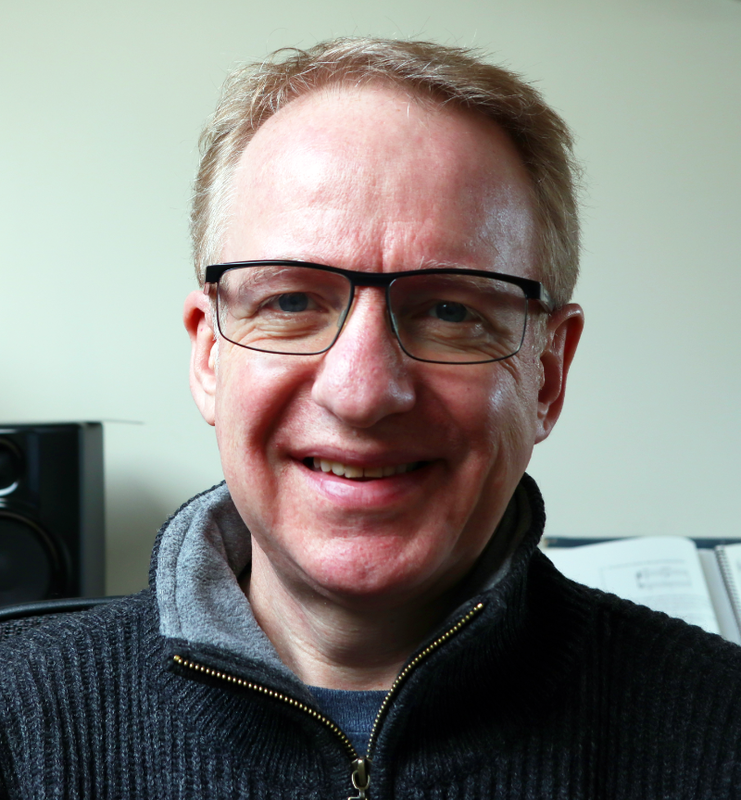 I’ve collated some stats on the usage of the online site(s) in various guises over the past 20 years below — not helped by early stats relating to “hits” or “visits” and more recent measures relating to “unique visitors/users”. 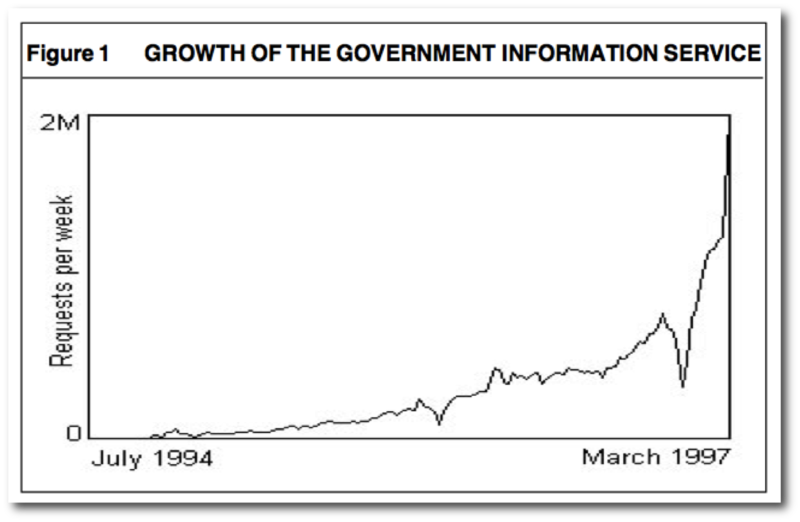 So don’t take this as the definitive or final comment on the growth of online government information and services but a partial snapshot at a moment in time … (and if any of you have additional interim dates and usage stats not shown, let me know and I’ll revise/improve the list).